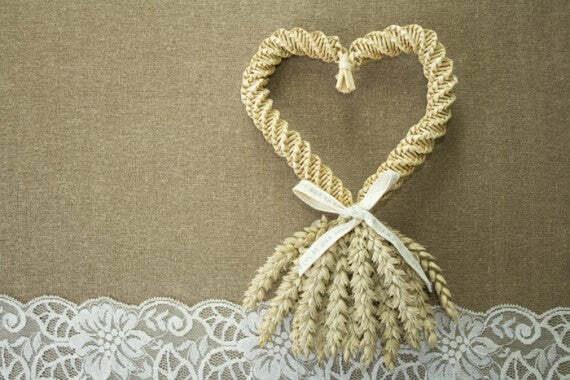 Wedding in a Teacup is delighted to introduce these beautiful, hand-crafted, natural corn lovers’ knots, hearts and horseshoes to bring blessings down on your wedding day! 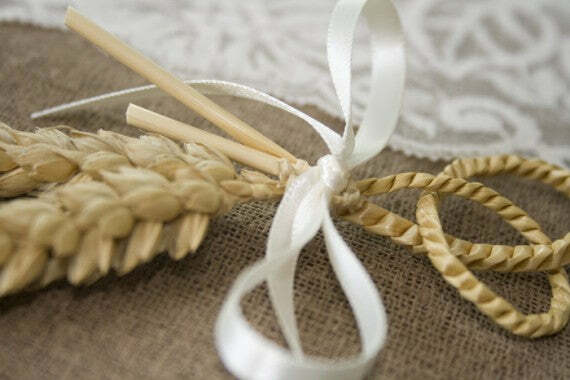 With centuries of British rural tradition behind them, they’re ideal for a country, eco-friendly wedding. They are made by the talented Elizabeth in her Cambridgeshire workshop; she selects the best ears of golden corn, cleans and cuts them, then weaves each item especially for you. It’s a skilful and time-consuming process (the hearts, for example, take well over two hours each) which makes her creations all the more precious. Corn weaving is an ancient rural craft. Since time immemorial, the last wheat sheaf to be scythed at the harvest was believed to house the spirit of the corn. The best ears of corn from that sheaf would be woven into a beautiful ‘corn dolly’, and hung over the hearth to keep warm over winter. Next spring, at sowing time, grain from the dolly would be shaken out in the field to bring fertility to the new crop. Despite combine harvesters, the corn dolly tradition has never died, and the weaving skills are still passed on. 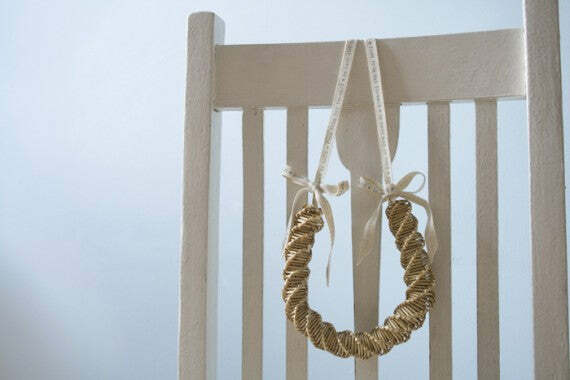 Corn dolly shapes vary tremendously, from actual dolls to elaborate knots; Elizabeth’s horseshoes, knots and hearts are very much part of the same tradition.